Maybe it’s due to the constantly changing weather we’ve been having where I live–hot enough for shorts one day, cool, wet and sweater-required the next–but I starting craving lentil soup. I must have 10 recipes for lentil soup, not all of which I’ve made, and not one of which I’ve made did I love. However, I happened upon a version of this recipe in a past issue of Martha Stewart Living, and had it tucked away in my mind and in my recipe binder. I made the soup last night, tweaking the original recipe just a tad–delicious! I loved the balance of the curry with the coconut, and the sweet/sour combination in the dried cherries. The color combination of golden orange, dark red and green was beautiful to the eyes as well. In addition to being tasty and easy to prepare, this soup is hearty and nutritious. Lentils are an excellent low-fat, low-sodium, high-protein (17 grams per cup!) and high-fiber (nearly 16 grams per cup) food. They also pack a punch of folate which your body needs for iron production. This recipe also contains a hefty amount of ginger and garlic–two ingredients with known anti-cancer properties, and carrots, an excellent source of Vitamin A and beta-carotenes. You could serve this as a starter, but I find lentils so hearty that I recommend making this your main dish accompanied by a simple side salad. Heat oil in a medium-sized saucepan over medium heat. Add ginger, garlic, shallot and carrots, and cook, stirring frequently until all have softened, approximately 7-10 minutes. Add the curry powder and cook, stirring constantly until fragrant. Add salt, 1/2 cup of the coconut milk, maple syrup, 4 cups filtered water and the lentils. Bring to a boil then reduce heat, cover and simmer until lentils and carrots are completely cooked, 10-12 minutes. Puree to desired consistency in a blender. Divide into four bowls. 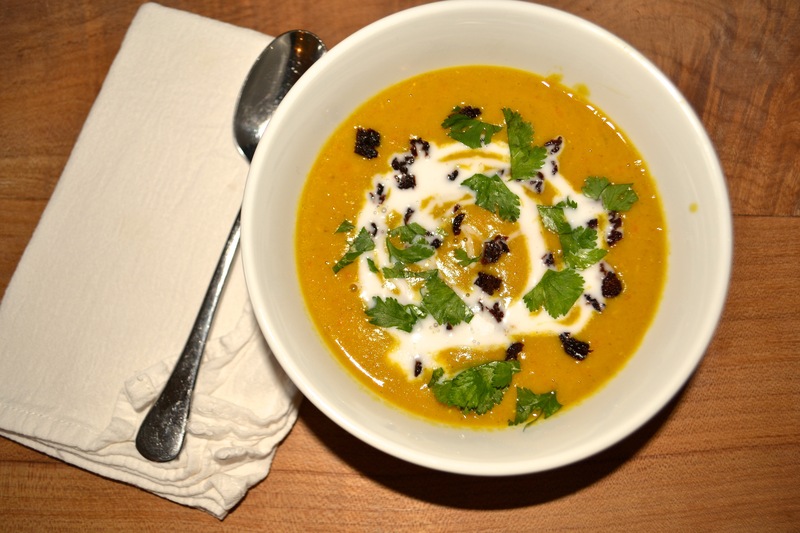 Swirl in the remaining coconut milk, and garnish with the chopped dried cherries and cilantro. Serve immediately.